On Tuesday Nov. 8, the United States will have one of its most crucial elections in the history of the nation. Yes, I realize that many will say that just as many people felt that way when Democrat Obama faced off against Republican McCain in 2008 or when the former competed against Republican Romney in 2012. Or when Republican George W. Bush defeated Gore by the narrowest of margins in the electoral vote in 2000. But the overall indecency, mendacious behavior, boorishness, misogyny, racism and complete lack of moral character of Donald Trump make this election cycle an entirely different beast. So much so, that in retrospect, regardless of very different policy positions, all of the former Republican and Democrat presidential candidates, Obama, Romney, McCain, Kerry, Bush and Gore, seem like the same thing when compared with such a horrific outlier as Trump. NONE of these presidential nominees and presidents, by the way, will support Trump on election day. Neither from the Democrat side nor from the Republican side. To start with science—or at least statistics—going towards Tuesday there are very different outlooks among the pundits and pollsters. I have been clicking with a high level of obsessive-compulsive disorder every few hours, looking for trends and changes. My clicking usually starts with the New York Times (NYT) Upshot, which provides a percentage-based prediction for the likelihood of an electoral vote victory. This is regardless of the number of electoral votes (EV)—it provides the percentage of likelihood that, say, Clinton will obtain over 269 EV, which is enough (270) to win the election. Right now, Clinton stands at 84% likelihood. This is based primarily on state polling data (and some national data, I believe) and there is a calculation of the relevance of each poll (its overall technique and quality, the number of people surveyed, how recent it was, etc.). Accordingly, based on these polls, a % prediction for the individual state is made. Once all 50 states have their specific prediction values, the election is simulated millions of times, and the likelihood of all possible outcomes is calculated. Thus, a histogram plot is obtained, and if Clinton wins more than 269 EV 84% of the time (and that could be 270 to 538), her election chances are given at 84%. Other prediction sites still waver between mid 80s to low 90s in terms of probability that Clinton will win. One interesting site, now at 87% probability of a Clinton win, is the PredictWise site that essentially doesn’t work by polls and statistics, but primarily uses betting markets to calculate possibilities. Starting near 60% for Clinton in Jan. 2016, this site has steadily climbed toward the ~90% range where it stands today. And yet, since this is no ordinary election, any prediction that leaves 35%, 16%, 10%, 5%, or frankly, even <1% possibility that Trump wins, is still enough to unsettle my stomach. The common wisdom at this point of the election cycle is that the key is now to Get Out The Vote (GOTV). Clinton has been using her strong support by popular President Obama, even more popular First-Lady Michelle Obama, and a slew of pop culture favorites who are (hopefully) going to sway the millennial and young voters to go vote on Tuesday. I did my share, volunteering to man the phone banks at the Democratic Party of Nebraska headquarters, here in Omaha. 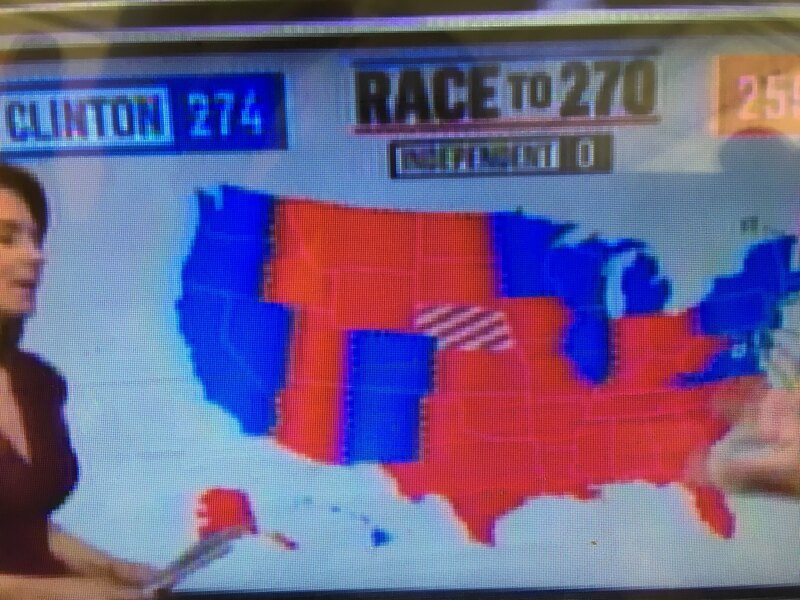 If the race turns out to be tighter than Sam Wang expects, pundits believe that a potential path to 270 for Trump goes through Florida, North Carolina, Nevada, and New Hampshire (as well as a single EV from one district in Maine), possibly leaving him stranded at 269 EV. Nebraska, like Maine, is one of only 2 states that can split its EV and isn’t simply all-or-nothing. While Nebraska is typically considered a “red” or Republican state, this is somewhat of a misnomer. We have 5 EV, and 3 districts, with 1 EV going for each district winner, and 2 EV for the overall state winner. Omaha largely constitutes a district, and in 2008 went for Obama, splitting Nebraska’s EV vote to 4 for republicans and 1 for Democrats. “Redistricting” (also known as Gerrymandering) likely caused our District 2 to support Romney in 2012, but the race is tight for our district now in 2016. Remarkably, and unlike the previous elections here in Omaha, there are NO ELECTION SIGNS. NONE. Except for congress (Ashford vs. Bacon) and local legislature, which is also on our ballot. This is a sign that both candidates are deeply disliked; but in a typically red state, I would guess that it says more about Trump than Clinton. Work on the phone banks was mind numbing. 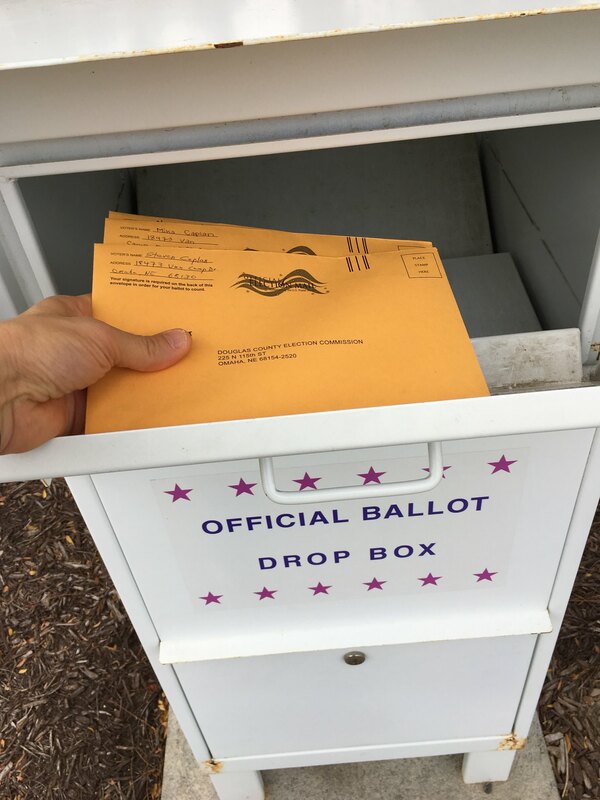 Given a laptop that automatically dialed potential democratic voters or independents to ask them if they were going to support Clinton and go to vote Tuesday, I realized how many Americans take our governmental system for granted and are largely unconcerned about what happens. Or uninformed. I was struck by people who honestly told me that they hadn’t yet made up their minds, or hadn’t really thought about who to vote for. To me, it seems as though they must be living on a different planet. But perhaps they look at me and wonder why I have high blood pressure. Perhaps one has to fear for the loss of the democratic process in order to appreciate how important it is. Scientists need to be optimists—especially with the grant situation the way it is. Based on the data, and despite the emotional ups and downs and the changes in the scope of victory predicted from just a few weeks ago, I am inclined to predict that Clinton wins with 312-323 EV. The more the merrier, but any combination above 270 is sufficient. I am almost embarrassed to note that I almost wanted Trump to win the Republican primary, as I thought that it would tear apart the Republican party for generations to come. That may still happen; or perhaps it has already happened, as can be seen by the number of high-ranking Republicans who have shunned him. It is entirely feasible that should he lose, the party will essentially be split, and an inner party war will occur with a fight over the future of the party between those Trumpists and alt-rightists, and those who are appalled by what the Republican party has become. Conservative columnist George Will of the Washington Post resigned his Republican registration in protest, and wrote a column discussing how the GOP needs chemotherapy. In a short email discourse with him in response to his column, he agreed about my take on the direction of the party and wrote that he had written in a ballot for the junior Republican congressman of Nebraska, Ben Sasse, who has consistently maintained staunch opposition to Trump. What will Trump do if he loses, as I anticipate? His contention about “the election being rigged” does not bode well. He is neither a good loser nor a good winner (for that matter, he is not good at anything). The most likely scenario is a failure to concede gracefully, possibly coupled with calls of corrupt elections and more people-whistles. To what end? Some say for a TV-media empire. I don’t know—my guess is that like with most things, there is no particular plan except to satisfy his anger, frustration ego and greed, and to cover his incompetence. Just as he couldn’t refrain from tweeting lies about a former Miss Universe in the middle of the night, he will be unable to contain his embarrassment about losing (and to a woman!). What ramifications will that have for the country? I think that will speed the splitting of the Republican party. For now, many low-life hangers-on are awaiting potential political booty in case he wins (Giuliani, Christie). But when he loses, and becomes just another loser in the course of US history (as he has called Romney and McCain so disdainfully)—that’s when everyone will finally abandon ship. On the other hand, if he does win? With a candidate who threatens to put his opponent in jail, and threatens the free press—this could very well be my final blog. Yes. It’s that serious. Take him literally. This entry was posted in science, Uncategorized and tagged 538, Clinton, Democrat, election, mendacious, misogyny, nate silver, NYT, obama, politics, prediction, president, princeton election consortium, pundits, racism, Republican, sam wang, science, statistician, statistics, Trump, Upshot, US. Bookmark the permalink. Those of us outside the US, who don’t have a say, also fear a Trump presidency. But, of course, electing Hillary isn’t enough. If she is faced by a Republican-controlled Congress, as Obama is at present, then she can propose whatever she likes but they won’t vote it through. I guess that the Senate is the critical House here because Democratic Party control in it (or even a 50-50 tie) will allow her to get her Supreme Court nomination(s) through. It looks like the House of Representatives will stay firmly Republican.